Are you struggling with Migraine Pain? Are your doctor's medications unable to ease your migraine pain? Does your migraine pain keep you awake at night? Hypnotherapy can help ease your pain! Imagine enjoying being healthy, CALM and detached from pain! Pain control, including migraine headache relief, is one of the well-known benefits of hypnosis. The brain knows how to stop the cycle of pain responses that are in your body and mind. Hypnosis will teach your brain how to turn off the pain responses, and also to relieve the sensations that are a result of the trauma (physical or emotional) that make the pain continue. Why does hypnotherapy work so well for pain control? When an injury or surgery creates pain, some of the pain is a result of the trauma to the body that is then coded in the brain. Even though the pain is a very real physical sensation, the brain is often the cause of the pain. Your brain continues to react to stress or events in your life and engages the pain response. 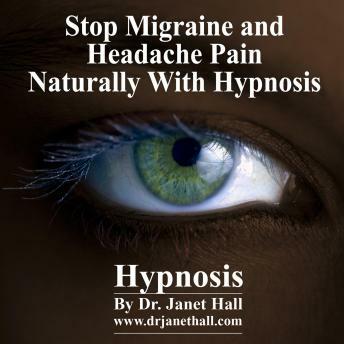 Dr Janet Hall's "Stop Migraine and Headache Pain Naturally With Hypnosis " hypnosis recording will get YOU to go deep inside and experience physical release of pain. Your mind will go into a deep healing trance, creating powerful cellular communication that will change the way your brain perceives pain. You can experience this deep healing and resolve your migraine pain. Maybe this is just what you have been waiting for! Be Persistent - keep listening and you will feel better! "How To Get Sensational Results With Dr Janet Hall's Hypnosis". Dr Jan authored eight books on family and relationships and recorded over 55 audio-recordings, many of them including hypnotic material. She founded Richmond Hill Psychology in Melbourne, Australia.